Knitting a sweater is one of the pinnacles of the hobby, and it's one that stops some new knitters in their tracks. 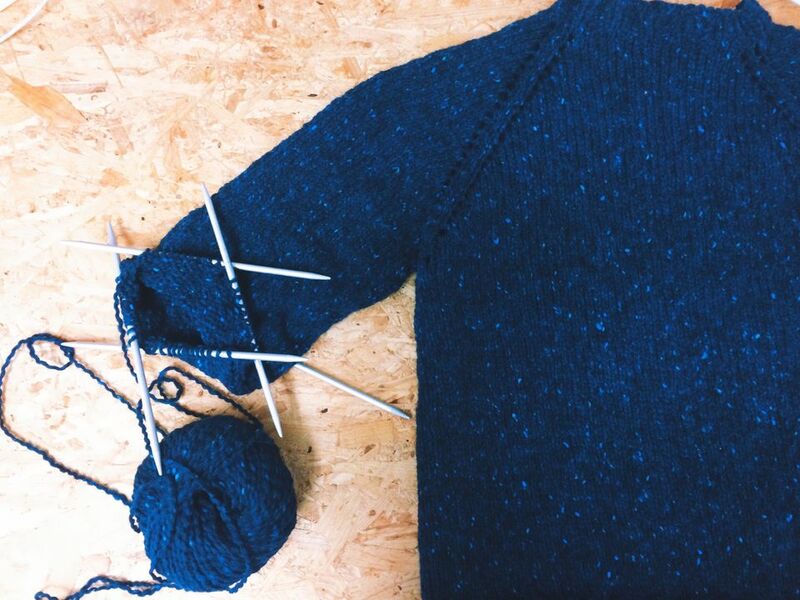 A sweater seems like such a big project that will take a lot of time and requires a lot of skill. It certainly can be all those things, but there are sweater patterns out there that newer knitters can do and that don't include a huge time commitment. If you've been worried about knitting your first sweater, here's a great overview of the basic skills you need, some good patterns to try and more information to get you started. Before you knit a sweater, there are a few knitting skills you should have under your belt. You should be comfortable with casting on and binding off, as well as forming the knit stitch. Purling comes in handy, too, if you're knitting your sweater flat or if it has ribbing or a textured stitch pattern. Depending on whether your sweater is knit top down or bottom up, you'll need to know the basics of increasing and decreasing, too. You should be comfortable with reading a basic knitting pattern and deciphering knitting abbreviations. Though skill level is relative, understanding the skill level listed on a pattern can be helpful when choosing a first sweater pattern as well. If you're a little nervous about knitting an adult-sized sweater, you can always start by knitting for a baby or child. Little sweaters contain all the same skills as bigger ones, but they'll finish faster, giving you more confidence in a shorter period of time. Eileen Casey's basic baby sweater, for example, is a great first sweater because it's all Garter Stitch and there's hardly any shaping at all. It'll knit up in no time, and if you don't know a baby, it's a great charity knitting project. Her child's cat sweater is super cute, too, and you don't have to put the cat on the front if you want a plain, straightforward knit to practice on. If you're looking elsewhere for sweater knitting patterns, look for projects in garter stitch, Stockinette or other easy stitch patterns. You can choose a circularly knit project if you're comfortable working in the round; then you won't have to worry about finishing. Heavier weight yarns make a project go faster, so you may be able to knit faster than your fear. Don't choose a project you don't like just because it's easy. You want to be able to wear and enjoy your first sweater, so take some time choosing a great pattern for you. There are also great books and courses to help people knit their first sweaters, such as My First Cardigan Workbook by Georgia Druen, The 30 Day Sweater Book by Lacie Lynnae and the Craftsy course My First Sweater by Amy Ross. When you knit your first sweater, it may be the first time you really have to take gauge seriously. When knitting pieces that are designed to fit a body, you need to get accurate gauge so they'll come out the size the designer intended. Take the time to swatch, wash your swatch as you will wash your sweater, and measure your swatch honestly. Reknit on different needles if you need to. Even though you're excited to get started, you to end up with a sweater that fits, so take the time to get your gauge right. Once you've taken all the time needed to get gauge and knit all the pieces your sweater requires, take a little more time to sew your seams properly. The right finishing can make all the difference in having a sweater you're proud of and one that lives in the back of the closet. Mattress stitch is essential for sewing side seams, while a horizontal seam works to join bound off stitches together, such as shoulder seams.